Come solve the mystery! Tricky clues, engenious puzzles, awesome family fun! Use coupon code "-40PercentOff-" when you book online. 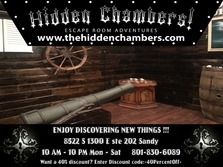 Then show your Utah Kids Club card when you arrive to validate the discount. Walk-ins welcome, as long as there is time in the schedule. Reservations Recommended. Be sure to use your free ticket that came in the Halloween Package. 1 FREE ticket per reserved escape room.